Watch out when unscrewing the spark plugs, they could loosen suddenly sending your hand onto a hard or sharp surface resulting in an injury. 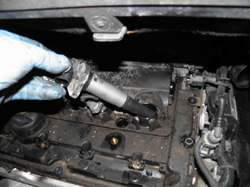 Compressed air is mandatory for old engines to clean the spark plug surroundings prior to removing it. ​It is more difficult to replace the spark plugs on old engines rather than on newer ones equipped with coil-over-plug ignition systems. 1- Start by removing all air hoses, air filter assembly, etc. 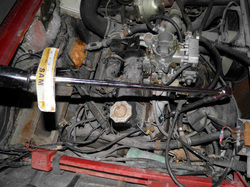 to clear the area above the spark plugs. 4- On newer engines you need to remove the coil-on-plug COP. 7- Unscrew and remove the COP if a bolt is there or else simply take it out. Go to step 9. 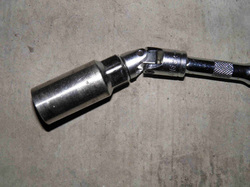 10- Use one or more extensions until the handle can rotate freely and unscrew the plug. It will oppose some resistance at the beginning then loosen all of a sudden and rotate freely afterwards. 13- Assuming you bought the right plug and checked the electrodes gap conforms to your vehicle recommendations, place the plug in the socket. Plug sockets have a rubber holder that keeps the plug in even when turning the socket downward. 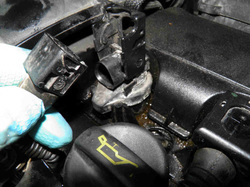 2- Locate the plugs by following the ignition wires. 5- Lift the handle up. 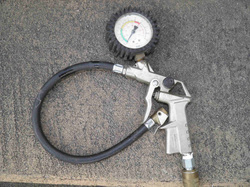 8- Blow the area around the plug with compressed air to avoid that any accumulated dirt around the plug goes into the engine. 11- Make sure your socket did go well into the plug. Do not force in case of doubt, remove it and push it in again while rotating it right and left until it moves downwards and you feel it touching the metal. 14- Rotate it BY HAND until it stops. It should turn freely. If a plug does not go as deep as the others, you may have started to rotate it with an angle, remove it and repeat until it works. If it doesn't, that means the plug thread could have deformed especially if someone had previously dismantled them while the engine hot. You need to re-thread the seat (not covered by this pictorial). 3- Pull out the wire connectors. Do not pull with the wire, make sure to hold the connector itself when pulling. 6- While pulling out the connector. 9- You need to have the right socket, a cardan joint, two extensions of different length and a good ratchet drive handle of 3/8" or 1/2". 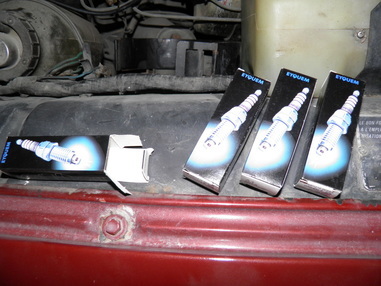 12- Place the plugs you removed in the same order than their location in the engine. 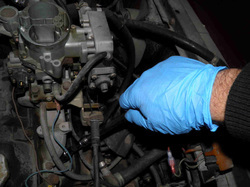 Inspect them for "reading" the engine tuning and health prior to throwing them away (not covered by this pictorial). 15- Tighten with a torque indicator to 1.75 mKg for conical plugs and 2.5 mKg for washer seal plugs. if you have no indicator or no torque wrench, tighten the plug until it stops then add 1/16 of a turn for conical seats and 1/8th for washer sealed plugs.